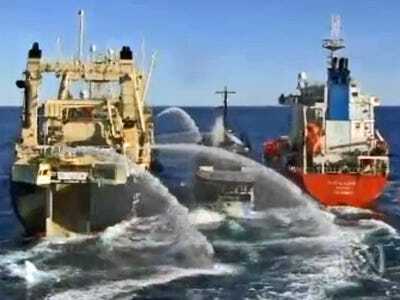 On Monday anti-whaling protestors — known as Sea Shepherds — successfully clocked a Japanese whaling ship from refueling in Australian waters near Antarctica. 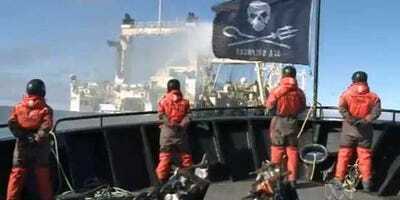 Hayashi called anti-whaling protests “a cultural attack, a kind of prejudice against Japanese culture” as The Associated Press reported that America’s largest federal court deemed the to be “pirates” because of the violent nature of their some of the tactics. For the last few years the Sea Shepherd Conservation Society — a Washington state-based nonprofit — has chased Japanese ‘scientific whaling’ fleet off Antarctica for several years to prevent the mammals being slaughtered. AFP notes that unlike Norway and Iceland — which openly flout the International 1986 moratorium on commercial whaling — Japan justifies its hunts through a loophole that allows for lethal scientific research. Recent research shows that both dolphins and whales communicate with each other in a similar way to humans. Previous scientific studies have shown that dolphins and whales are earth’s smartest animals behind humans and ahead of chimpanzees.